Why Do Women Wave Their Hands over the Shabbat Candles? When lighting Shabbat candles, why do we wave our hands three times inwards before making the blessing? I saw my mother and grandmother do it, but no one can explain it to me, other than saying we are bringing in the Shabbat energy. Resting takes a lot of work. Many people are great at achieving, but find it hard to stop achieving. They know how to do, but don’t know how to just be. Shabbat is the day of rest, and to do it right, you need to know what resting means. Resting is not doing nothing. If it was, there would be no reason to feel rejuvenated after a rest. Not-doing may not drain us, but why should it replenish us? True rest is the ingathering of our soul energy.1 After expending our powers outward, we draw our energy back inward. During the workweek we are pulled in all directions, and our frantic activities drain our soul. The creativity and inventiveness that lies within has been exhausted, and so we need to draw our energy back to its source to be replenished and renewed. Perhaps this is symbolized by the inward-waving motion at candle-lighting. We are beckoning our soul energy to come back to its source. For six days we were outward beings, investing ourselves in the world around us. On Shabbat we pull back, holding our energy in to regain focus and balance. Our retreat from the externalities of life happens on three levels: action, speech and thought.2 On the level of action, we refrain from doing actual work on Shabbat. But on a deeper level, the level of speech, we refrain from even talking about work-related matters. We don’t make deals, and we don’t plan for the week ahead. We hold our soul energy close, using it only for enhancing our inner life—our connections with family, friends, community and G‑d. And then there is an even deeper level of rest on Shabbat, the level of thought. When we reach this level, we feel as if our weekday life doesn’t even exist, and we don’t have a worry in the world. So when you wave your hands three times, have in mind that you are about to enter a realm of inner rest, retreating from the superficial world and all its demands on three levels: You’ll stop working. You won’t talk about work. And you’ll even stop worrying about it. When all those external layers are gone, what is left? Just you, your soul, and the relationships that really matter. There appears to be no source for the hand-waving in classic rabbinic literature. Rather, it seems to be an outgrowth of an older custom to cover the candles until the blessing is made. Normally, the blessing is recited before the performance of a mitzvah, but here we light the candle and recite the blessing afterwards. (This is because once the blessing is recited, Shabbat has been ushered in, and lighting the candle would be forbidden.) So we postpone the completion of the mitzvah until after the blessing, by covering the candles as soon as we light them and we then cover our eyes while saying the blessing. Thus our first enjoyment of the Shabbat light–and the fulfillment of the mitzvah–occurs after the blessing. See also Why do we cover our eyes when reciting the blessing on the Shabbat candles? Likkutei Torah, Shabbat Shuvah 63c. Likkutei Sichot, vol. 11, pp. 80–85. Is it forbidden to do "work" after Shabbat candle lighting time? Are your candle-lighting times for Palm Springs, CA, correct? 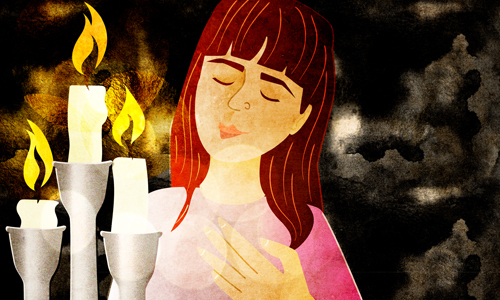 Where Does the Torah Say to Light Shabbat Candles? Recite the Blessing Before or After Performing a Mitzvah? Please explain what I can do if I am not allowed to have an open flamed candle in my cabin on the ship that I work. What can I do to still perform the mitzvah of lighting Shabbat Candles. Are the electrical candles? First you light. Of course you have to look at what you are doing. But this seeing is just practical, it isn't official. Then, you draw the holiness toward yourself personally, with your hands, three times. It's not general waving, it's scooping the holiness toward you,yourself. Then, you cover your eyes, because technically, you aren't allowed to officially see the candlelight yet, because you haven't thanked G-d for it. Once you have said the blessing with eyes covered, you should uncover your eyes and look with concentration at the flames, so as to really see them now. If you didn't do that, it might sort of become a blessing in vain. your real seeing is after the blessing. And they do look different from before the blessing. I found this the most complicated answer since Einstein came up with the The Theory of Relativity .! Shabbat Candle-lighting We say a woman should light the candles, wave her hands to gather in the light, then cover her eyes to block the light and then say the blessing. In daily Jewish practices, you say a bracha/blessing before doing the action. When you eat an apple, for instance, you say a blessing before eating it.